Become the famous Resistant Fighter in The Finn Jacket, made from 100% genuine real leather. Inside, there is viscose that has been stitched to absorb moisture. Outside, there are three pockets with belted cuffs. Get this latest outfit today as seen in Star Wars - The Last Jedi. All the diehard fans know the story behind Finn and the reason to like him and to wish to look like him. The brave soul of Finn was once with the Stormtroopers and now is a part of the resistance as he came to know about the cruelty and unjust behavior of the empire. This heroic deed of Finn made him a fan favorite at every Star Wars convention. Now you can dress up in the Finn costume with total ease and comfort. This well thought manual is the most accurate one to guide you through the details of the most cherished Star Wars costume of the new era. The packaging was perfect. Well sealed, compact without damaging the jacket. Professional looking. The jacket was exactly how it was advertised. It fits perfect (which for me is the hardest part of shopping online). I really can't say anything bad about my experience with this company or product. In fact, I'll probably order myself the Star Lord jacket for Christmas. I could not believe the quality of the product I received. It is expertly made, uses very supple and attractive leather and fits like a glove. 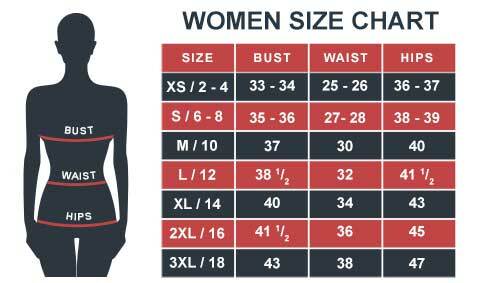 READ the measurement chart and make sure you USE it to guaranteed the right fit. Had a little bit of a time with communications BUT the item arrived within 4 days. a great medium to light jacket, good color not exactly like the movie which is good because i dont want to look like im cosplaying in everyday life. The best part about this jacket is not being attacked by a girl with a big metal stick and a droid that shocks you. I don't usually review products but I could not resist for this item. So this jacket just arrived (within a week!!!) in time for the holidays. I purchased it as a gift for my brother. Not only is the material soft, comfortable, and warm, but it seems very durable and high quality. I am usually skeptical about ordering online, but this gamble was worth every penny. If this jacket fit me, my brother would be getting something else for Christmas. I would have kept it myself! Overall, wonderful product and it even comes with a garment bag for easy storage and wrapping. Would order it again ten times over. True to size, true to description. Good quality leather jacket. The beige color is a little light but I weathering it it seems a little darker and more movie accurate. I originally got the distressed brown which starts out way too dark, so I figure this is the way to go and glad I did. It fits a little big in the shoulders and a little long in the sleeves and a little shorter in length than the movie. I'm 5'11" ~150 and the medium is good on me. Large would be too big and small would be too small... Also ships super fast, got mine within 6 days I think! I got some greeblies from Barton and bishop on etsy to make it more movie accurate too and now it looks awesome! Not a 5 star bc of the shoulder fit and sleeve length, but overall very satisfied with this jacket! I would recommend! After looking at the few Finn jackets on here repeatedly I ended up going for this one. Arrived within a week. Fits great, feels good quality and nice soft leather. Detailing is great and even has some loops below the left hand pocket which aren't too obvious. The 3 inner pockets are decent size with one of them just right for an iPhone 6 which is also true of the breast pocket. Love this jacket and only wish weather was cooler so I could wear it more. I'm 5'10, 190 lbs and 43" chest and the Large is just right. If anything, the sleeves could do with being 1 to 2" shorter but that is not big problem. Mistakenly ordered this jacket instead of the Distressed brown jacket which includes a zipper. I'm currently exchanging it for that one, but I must say that I was still impressed with the quality of the jacket. I did try it on to check if my sizing was accurate, I ordred a large and it was a bit snug on me so I made sure to go with the XL on my exchange. I'm 5'9" and about 220 pounds. The customer service team here is outstanding, highly responsive and does a great job of letting me know what is going on during the exchange process. I'll definitely be recommending this company to others! Sorry for my english, I'm a french buyer. I have to say that I was very surprised of the quality of this Jacket, that is really really good, for only 169 $ and that is real leather. I found no defaults. I received it 6 days after I ordered it. That is the exact model of the film. 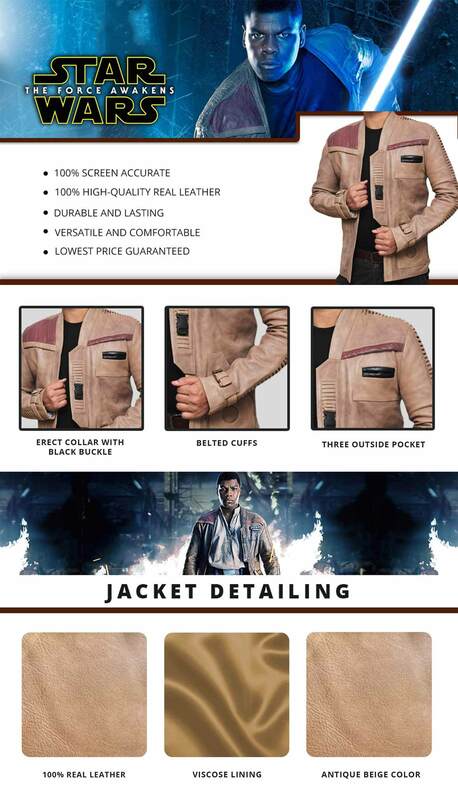 I choosed the Finn Beige Leather Jacket, because it looks "fresh" and not so "tired" that another model of jacket, (Poe Dameron Finn Brown Waxed Jacket) so I can wear it frequently. Just one thing about the measure, I usually wear XL clothes in France, my chest measure is 109 cm, so I choosed the L model, and I have to say it is not too small. Perhaps a little little bit large, but, only if I wear a small t-shirt under. If I change and choose the M model, the arms will be too shorts. If I wear a shirt under, it's perfect. So you made me very happy. Thank you. It's calling to you...just let it in. Out of all the many Star Wars replicas I own, this is without a doubt the one of the highest caliber. Not only is it well-crafted, but it is also light, comfortable, and has the spot-on character quality that you need to be a part of the Star Wars universe. It is great to wear around the house or for Halloween. You can even become "that guy" that wears a Star Wars jacket in public with this one (it is that cool!). Now all I need is a starfighter, and I'd be set for life. The jacket is of really great quality and is very comfortable to wear. The delivery has been lightning fast and the support team has been of great help regarding sizing and so on. Highly recommended you will not regret it. I'm going to first say the quality is very impressive and is a soft leather, looks fantastic just like the movie. Wish the back upper shoulder area had the vertical stitching like the authentic and the back of the collar with the horizontal stitching (Maybe they'll add it in the future ;) but aside from that this jacket comes as close as it could. You could be nit picky and ask for the loose straps on the bottom left of the front of the jacket but there are straps there, just not loose. So once again this is a raving review its quite a beautiful jacket. Here is my one legitimate complaint, I am 5'9" very active with a muscular build I weigh 175. I always wear a medium in my clothing and was skeptical if for a jacket I should be ordering a large or medium but decided to go medium seeing it's to be a fitted jacket instead of like a winter one. I should probably have gone with a small, the arms fit me pretty snug but the armpits down to the bottom of the jacket were made rather large, boxy could be the best description. Obviously I can't expect a tailored look because they don't know if it's someone fit or wide so it's tough to complain but I thought a medium would fit slimmer. Shoulders were a little wide too like a suit jacket instead of rounded and relaxed to the body. Maybe I just need to break it in some, I'm writing this as of the day that it arrived. Shipping took about 3 weeks from order day, but rest assured people I am from Pennsylvania and live in the States. This is not a fake site and you will receive your product with a smile on your face. I was very wary of ordering a jacket, hoping the jacket would look and fit as advertised and not to get ripped off. My concerns were for naught, as the jacket arrived fitting well and looking just like the product pictures. This is a tremendous jacket, and shipping was prompt. I think I had the jacket within 2 weeks of ordering and discussing the fit with customer service. I will order again and I recommend the company. I was very skeptical when I first ordered this jacket but I'm a HUGE fan of Star Wars and I had to take a chance. Well that chance paid off. This jacket is amazing. It really is real leather, it fits like a glove. I don't know what else to say. The shipping took a little longer than I anticipated, but I placed my order around Christmas. When I did contact their customer support they responded very quickly and assured me it would ship as soon as it was done being processed. If you're reading this review, don't buy this jacket from ANYWHERE else. This is the best choice. This jacket is amazing and I couldn't be happier with my purchase. I'll definitely buy from these guys again. Keep up the good work! I ordered this jacket while they were switching from the brown and bright red shoulders, to the weathered beige with darkened red shoulders. They gave me an option of choosing, to make sure I received the item I wanted. Seeing that the beige was closer to the movie, I ordered that one. There are a few differences between this and the real on but the main color and details of the jacket are accurate, and looks much better than any other out there. I am 6'2" and 200 lbs, and the Large fits just the tiniest bit larger than optimal, but is light and comfortable. Can't wait for the weather to warm up and give this jacket a real weathered look. I ordered this for my son for a surprise for his 22nd birthday. He is a huge Star Wars fan and had shown it to me before. When he opened his gift and saw it he was in shock! It is so well made and fits perfectly and didn't think I had gotten it for him. This jacket is gorgeous and the customer service is amazing! It arrived quicker than expected. I highly recommend this company and jacket for any Star Wars fan. To any customer that is thinking about purchasing this jacket i am a verified happy customer.I have ordered multiple jackets from this company before this one and have never had a problem with shipping except this last time but that shipping mishap actually ended up working to my benefit to where i ended up extremely happen with the product in the long run. If you order this jacket, It will take a week maybe less to actually reach your doorstep once you get the confirmation email that your order was shipped. My particular experience they use Fedex and the package comes in a very professional package. The quality of the jacket is very professionally well done. I was expecting a little bit heavier cowhide leather almost like camel leather which is what finn wore in the movie but its really fine light real leather. My jacket is a distressed brown color, not the antique beige color. I got that particular jacket because i wanted zippers and the jacket to function, and it works out perfectly. I don't understand why there aren't zippers in the movie jackets (apparently in a galaxy far far away a long time ago zippers didn't exist lol). Overall, everything i particularly requested was worked on and my jacket turned out perfect. I am really glad i took the extra time for the perfect jacket design because Fjackets really delivered a quality product. I will order more jackets from them they are the best website in my opinion to order your film replica jackets from. Even if they don't have the jacket design you want from your favorite movie, they remain in constant communication within a day of your email. Which is another aspect about this company i love and what keeps me coming back. The jacket looks really good but I won’t buy it for myself. I’m going to gift it to my bro, whose room is filled up with SW collectibles. I showed him the jacket and he liked it but he didn’t have the money to buy it so he felt down. Being the awesome sibling, I plan to buy it for him. I had full confidence that this will definitely work. I’m thankful that you guys made the delivery process quicker so that it arrived on time and I can gift it to him. You guys are the best! Huge fan of Star Wars. I bought this jacket because I’m a huge fan of Star Wars. When I came across this store, I immediately noticed this product. I started thinking about if I should buy it and if it will look good on me. After receiving full backing from my dad, since he was paying, I ordered it. And, quite frankly it looks way than I expected it to look. The color was spot on and all the major detailing was present. It also provided me a good fit. So I’m very satisfied… it didn’t even take too long to arrive.